Everything is A-OK and fine and dandy with the banks, which say they&apos;d sail through hypothetical financial crises of their own devising. J.P. Morgan Chase & Co., Bank of America Corp., Citigroup Inc. and Goldman Sachs Group Inc. were among several big banks that released results Monday of company-run reviews showing their minimum capital levels would remain well above regulatory requirements during several quarters of high unemployment, falling home prices and stock-market turmoil…. Eighteen large banks released results from an initial round of the Dodd-Frank stress tests in March and were required to release the results of a midyear test between Sept. 15 and Sept. 30. The tests, which are based on banks&apos; own internally developed scenarios, are separate from stress tests performed by the Federal Reserve each year, called the Comprehensive Capital Analysis and Review, or CCAR. And rest further assured: The banks pass their own tests with even higher-flying colors than they pass the Fed&apos;s tests. 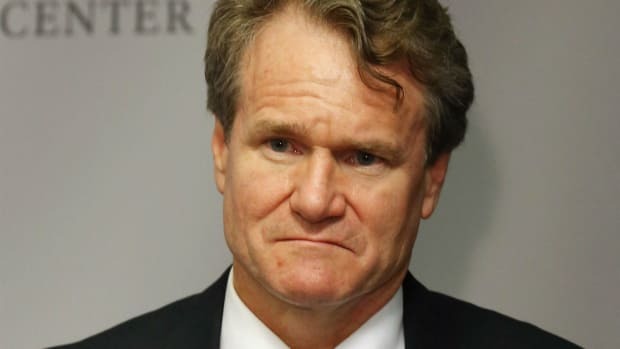 Bank of America said it projected its Tier 1 common ratio would fall to a minimum of 8.4% over a nine-quarter period, well above the 5% minimum level required by regulators. In March, the Charlotte, N.C., bank estimated the minimum level would be 7.7%. Morgan Stanley projected its minimum Tier 1 common ratio would be 9.5% under its analysis, up from the 6.7% minimum level it projected in March…. The Fed also doesn&apos;t release its own midyear results as it does in March, making it difficult to gauge whether the banks have a substantially different view of their capital strength than the regulator does. The Europeans are going to go ahead and test their banks anyway. The European Central Bank&apos;s upcoming assessments of bank balance sheets should include in-depth details on their government bond holdings to be credible, one of the central bank&apos;s top policymakers said on Tuesday. The ECB will directly supervise 130 top euro zone lenders like Deutsche Bank, Societe Generale and Santander from October 22, 2014 and wants to make sure they are adequately capitalized before taking up the reins…. The ECB and the European Banking Authority, a pan-EU banking watchdog, will also carry out a stress test of a much wider sample of banks than the 130 the central bank will supervise. How Could Comcast Do This To Goldman Sachs? The bastards apparently only thought of themselves and not of Lloyd and Co. when they walked away from the deal.